The Angel Connection: Star Child with guest Kay Goldstein! In a way we are all children of the stars on a journey to find our true nature. 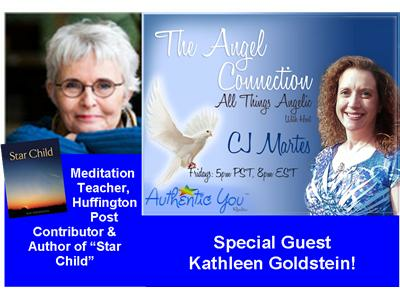 CJ welcomes Kathleen Goldstein to her show to discuss her new book, Star Child. "Star Child, written in a fairy tale genre similar to The Little Prince and The Alchemist is a book for young and mature adults. It explores in a simple and poetic way the challenges facing two “star children,” Terra and Marius, on their journey to learn about being human. Kay Goldstein is a cook, writer, and teacher of meditation who was delighted to find herself writing a story about star children. She is the co-author of A Book of Feasts, Stories and Recipes from American Celebrations, and has been a regular contributor to the Huffington Post and her own blog at http://www.kaygoldstein.com. Call toll-free during the show: 1-877-296-0345.